Love is a four-legged word. 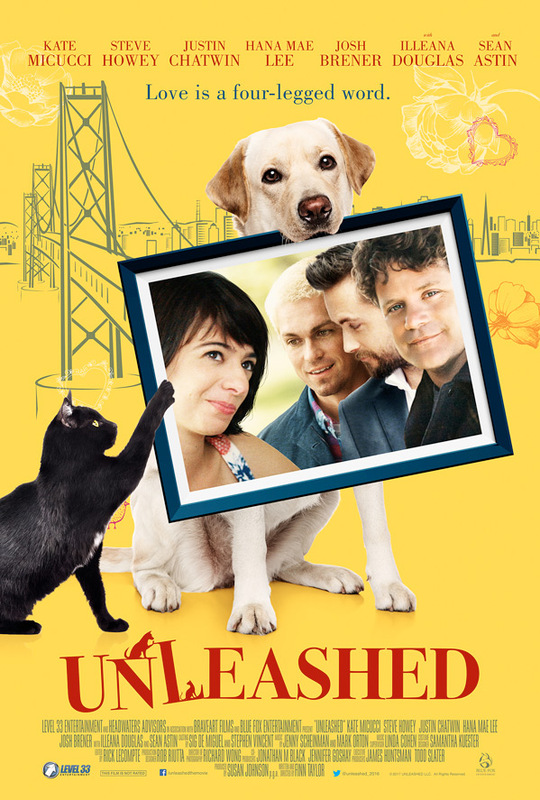 Level 33 Entertainment has debuted a new official trailer for the indie comedy titled Unleashed, written and directed by Finn Taylor. Yet another pet transformation movie, instead of a person turning into an animal, this time it's two animals turning into two people - two perfect guys. Kate Micucci stars as a woman who moves to San Francisco with her two pets after a break up, and learns about herself when they become these guys. Also starring Justin Chatwin, Steve Howey, Sean Astin, Illeana Douglas, Hana Mae Lee, and Josh Brener. This definitely looks very cheesy and almost way too quirky, but I like that the guys still act like her cat and dog, that makes it a bit more interesting. Have a look below. When a cosmic event turns Emma's (Kate Micucci) beloved pets, an adorable cat and an energetic mutt, into two perfect guys, Emma reconsiders her outlook on dating, hilariously works out her trust issues, and ultimately learns to love herself. Unleashed is both written and directed by American filmmaker Finn Taylor, director of the films Dream with the Fishes, Cherish, and The Darwin Awards previously. This first premiered at the Mill Valley Film Festival last year, and also played at a few other film festivals. Level 33 releases Finn Taylor's Unleashed in select theaters + on VOD starting August 25th this summer. Anyone?